Is the machine the correct size for your room? Have you checked the filter? Have you pressed the reset button? Has the machine been without power for over 24 hours? Fuse changed and still no power? Have you checked the fan setting? Has the timer been reset? 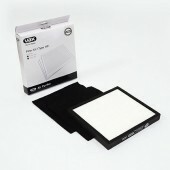 Replacement filter kit (Type 113) for your AP01 Vax Air Purifier. Includes 2x carbon filters and 1 x HEPA filter. Filters help to capture harmfull allergens such as pet dander, pollen and smoke,and should be replaced regularly to maintain optimum performance.